I’ve owned tens of phones over 18 years. Never have I even scratched one, let alone had to have one replaced. 3 months in with my watch, I had to get it replaced. I had an accident, the screen got dinged, it got a scratch less than 1/4 inch long, with some accompanying scratches. But, what forced the replacement was that the screen became erratic. Not responding, etc. so ultimately I had to use one of my two Apple Care replacements as I was 100% honest with them. How do you guys protect the face of your watch? I don’t see this thing lasting. I mean, it was the most gentle of bumps that caused that scratch. Here is the scratch that caused my screen to stop randomly responding. I have many tiny and a few very visible scratches on my first gen Watch, but the screen is still as accurate as new. I’m sorry to hear this has happened to you. 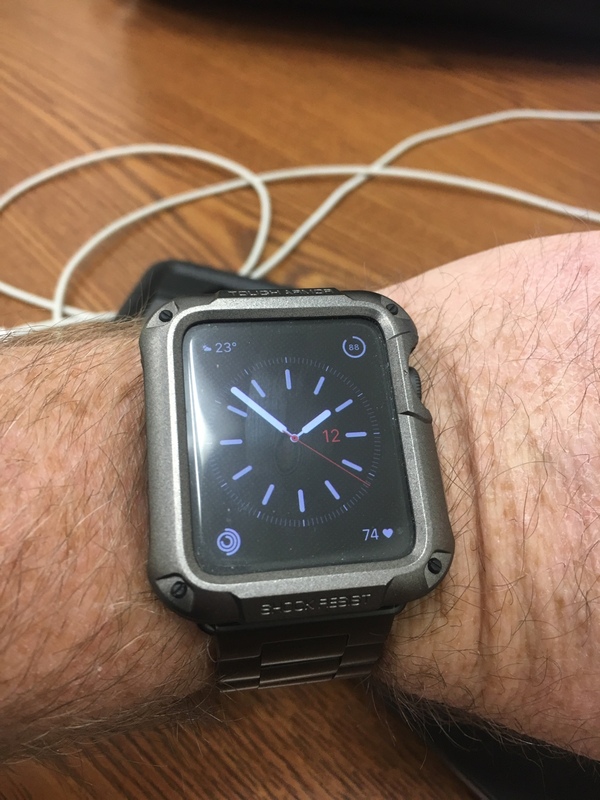 I have a Spigen Tough Armor on my 42mm S3. It works well and doesn't add a lot of bulk in my opinion. Has a built in screen protector and the touch screen performs without fail. I’ve only been an AW owner for a couple weeks, so my experience should be considered rookie status. Might be overboard in some people eyes, but I live in the country/mountains. So I am rough on my devices (I should be a poster board example for Lifeproof cases). Will put it to the test this summer out on wildland fires. Nothing to the effect on the screen or body. Same here. Never had a screen protector or protective casing on it and it looked darn good when I finally gave it to my youngest son around this past Thanksgiving. My current Series 3 Apple Watch will not have any protection on it either, and I don't foresee any damages to it. I don’t protect the face of my watches. For each scratch I have on my watches, it only brings back memories on where I was in the world. No protection here and my watch looks flawless. Not concerned about scratches when and if I ever get my first one. Sorry to hear that happened to your watch but glad you got a replacement with AppleCare. I have armour suit screen protector on it. Can’t even tell a screen protector is on it. Lifetime warranty on it as well. I had it on first Apple Watch as well. Worth it. Can’t even tell a screen protector is on it. Lifetime warranty on it as well. Right, I didn't mention that in my post, but the same is true with Skinomi. And it comes with six, in case it does peel, or you mess up installing the first time. 3 months in with my watch, I had to get it replaced. I had an accident, the screen got dinged, it got a scratch less than 1/4 inch long, with some accompanying scratches. But, what forced the replacement was that the screen became erratic. Not responding, etc. so ultimately I had to use one of my two Apple Care replacements as I was 100% honest with them. Would you mind elaborating a bit more on what caused the scratch? I'm curious just what it would take to do that. My AW0 and AW2 have never had a protector and they are scratch free. 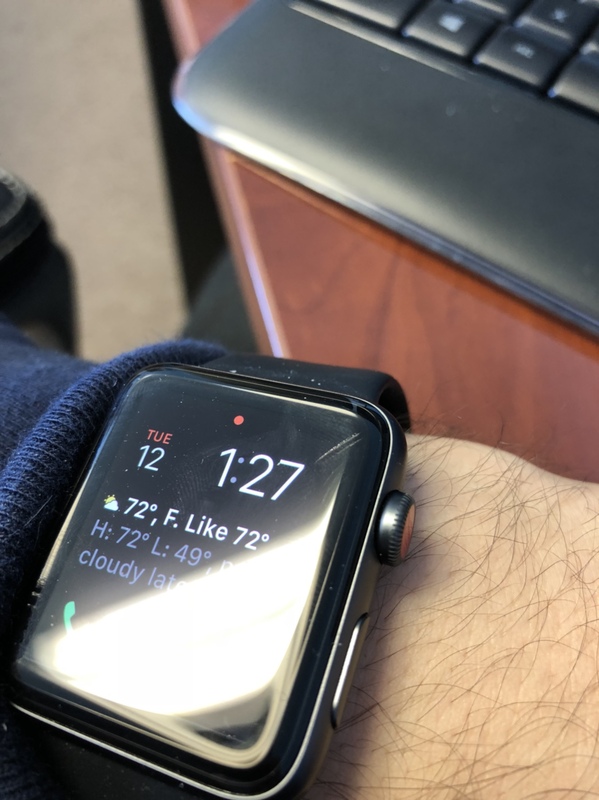 No protection on my Apple Watch 0. Now I do have the stainless steel watch which does have sapphire glass. I don't have a scratch on it and I use it at work so it does get the occasional bump. I have some micro scratches on the stainless steel but they polish right out with a jewelers cloth. When I had the sport Apple Watch, I was scratching the you know what out of the glass. I’ll never go sport again for that reason. Now I have the stainless steel watch and it comes with sapphire crystal glass. Wow what a world of difference. Not even a single blemish on the glass with this one. It’s almost impossible to scratch this glass. Wish the phones used this same glass. I never have to use any form of protection on my SS original AW and current Series 2 as both are also sapphire crystal screens. I've brushed my screen across concrete walls but they just clean off without a single scratch. I don’t see this thing lasting. I mean, it was the most gentle of bumps that caused that scratch. I’ve dinged and bumped my SB S3 everywhere, and it still looks brand new. I fell and landed on my elbow/arm. I didn’t even think the watch touched. As you can tell, that is an extremely awkward scratch for a fall. I checked the edges, no marks. I then went to check the time and saw that and yelled lol. I do have the lowest watch, not the ones with the sapphire glass. I think even a sapphire glass will scratch in this case. You know what works best for you better than anybody. I will say (as I've said before) that cases on watches can trap fine debris between the Watch and the case. This can cause fine scratches on highly polished surfaces. Bases on my experience, I can't recommend that any case be used on a SS Watch for the above reason. I tried one and got fine scratches in the SS with just one week's wear. I've tried buffing them out with limited success. I'll try again sometime, but given my success (lack thereof, actually) I'm not enthusiastic or hopeful. But on an aluminum Watch with its textured bezel, I doubt there'd be any damage whatsoever. To be safe I'd remove and wash the case and wipe the Watch down every week or two. The problem is in the more extreme incidents that would only scratch the Ion-X glass, sapphire might (and I emphasize might) break instead of scratch. The increased hardness of sapphire that resists scratches makes the display more brittle and subject to cracking or shattering where the the Ion-X glass would give some and merely scratch. Both can be scratched and both can be broken, but their properties tend to favor one over the other. Both my Apple Watches and my SS Watch run bare naked and none have the slightest scratch on the display. But I've worn watches every day for a very long time and being careful with them is second nature. The exception are my Casio G-Shocks. Even then their displays look pristine. All that said I say hard is better than soft and I prefer using protection when it doesn't get in the way. So I may look into the Armor Suit and Skinomi screen protectors. The important thing is most of us have not experienced any real damage to our Watches. My sympathies to those who have. Protect yourself from data loss for only $34.99!